INDOFINE Chemical Company, Inc., established in 1981, is committed to providing high quality rare organic molecules, biochemicals and natural products for the advancement of science. 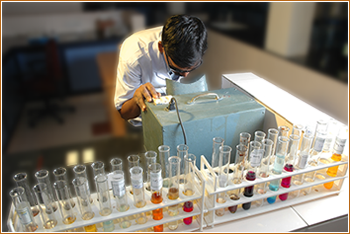 We provide custom synthesis, contract research, process development and toll manufacturing in the areas of flavonoids, coumarins, acetophenones, benzophenones, chromones, fluoro-organics, heterocyclics and natural products for the pharmaceutical, agricultural and life science industries. Last year, our development lab synthesized over 1,000 new compounds, including many combinatorial chemistry building blocks and compounds for medicinal chemistry projects. Our product catalogs are available for download in Adobe Acrobat (PDF) format. INDOFINE Chemical Company, Inc. has been a member of the American Chemical Society since 2001.